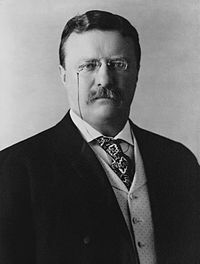 Theodore "Teddy" Roosevelt (October 27, 1858 – January 6, 1919) was the 26th President of the United States. "I have a perfect horror of words that are not backed up by deeds." Simple: I dislike it when people say they will do things, but do not. "The man who really counts in the world is the doer, not the mere critic-the man who actually does the work, even if roughly and imperfectly, not the man who only talks or writes about how it ought to be done." Simple: The person who does the work is the one that is important, not the person who only talks or writes about it. This page was last edited on 25 October 2009, at 23:26.